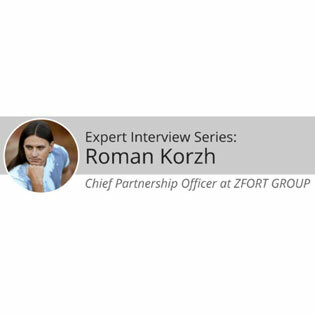 Roman Korzh, Chief Partnership Officer at ZFORT GROUP, is an experienced IT specialist who fuels mutually beneficial partnerships between IT companies. When should companies consider outsourcing IT functions? What are the benefits? There are two moments when you realize you have to outsource some IT functions. First, doing it in-house becomes uncomfortable. Second, doing it in-house becomes expensive. As companies grow, they go through a series of stages. In early stages IT functions can be done in almost any software, from Notepad to Excel to a less popular user desktop application. Then there comes the stage when top managers are not sure if they should stick to traditional ways or switch to the cloud. Sooner or later, there comes the stage where cloud-based services become pure necessity because they are much cheaper and convenient than keeping people on staff for internal needs. In my experience, companies with less than 15 employees have the freedom of choice, and companies with 20-plus employees just have to go to the cloud for IT services. What are the most important considerations decision makers need to make before switching to outsourced IT? Is it possible to migrate all of the legacy data to the new system? What happens if something goes wrong and we need to rollback the changes in a couple of days? Can we tailor the service to our needs down the road? In my experience, the cost of outsourced IT services is never a problem because it is way lower than in-house expenses. What trends or headlines are you following in the world of Cloud Computing today? Cloud Computing is getting more and more mature. Some standard building blocks emerge from the chaos of young provider-specific services. I think that mastering standard functionality is the key to reliable cloud services. How should organizations strategize moving functions to the Cloud? The rule of thumb is simple: one function at a time, and make sure the entire organization is accustomed to the cloud before you start moving the next function. If the previous migration to cloud hosting still causes headaches in any department, giving it time to settle is a wise move. What do organizations need to do to ensure their assets are protected when moving to the Cloud? Ensure the cloud is reliable, and the company who does the migration is reliable. Both people and the platform should know what they do and be in the market for at least a couple of years. What are some of the major changes you’ve observed in IT security since you started your career? When I started, it was all about desktops and local software. People and companies freaked out about firewalls and antivirus software, system logs and spyware. A lot has changed since then … Being connected to Internet became a hard requirement, collaboration features appeared to be more important than visual bells and whistles. Consequently, too many people are granted access to way too many resources, and revoking the access becomes a big challenge. Another big threat is people’s habit to have the same password for various resources (because there are just too many online resources to keep up with unique passwords). What are the challenges facing organizations today in managing their IT security? The biggest challenge is finding a compromise between security and convenience. Too much focus on authentication and people cannot do their work efficiently. Too many shared credentials and employees’ smartphones become a security black hole. Finding the proper balance is a tough challenge. How can businesses stay ahead of potential cyber threats? Where are businesses most often vulnerable? It is absolutely mandatory to have centralized control of user accounts and software updates – which is only possible in a proper cloud environment. Many companies are way behind on patching their servers, just because it takes a lot of time to track security alerts and apply the fixes in a timely manner. Another must-have practice is the ability to disable a particular user’s access to shared services with sensitive data. Guessing an employee’s password may be easier than most of us think. Any company’s biggest strength is also its biggest weakness: people. Considering switching to outsourced IT?